Sixty-eight student athletes and 37 teams from the Maricopa Community Colleges earned academic recognition today from the National Junior College Athletic Association (NJCAA) for the just-completed 2014-15 year. Sixty-eight student athletes and 37 teams from the Maricopa Community Colleges earned academic recognition today from the National Junior College Athletic Association (NJCAA) for the just-completed 2014-15 year. To qualify for the award, student athletes must have a minimum 3.60 GPA while earning at least 12 credit hours. Seven of the student athletes received NJCAA’s Pinnacle Award for posting perfect 4.0 GPAs. They are Evan Fresquez (Mesa baseball), Kevin McMahon (Mesa tennis), Alexis Flores (Phoenix soccer), Aly Kennedy (Phoenix basketball), Katerina Diaz (South Mountain volleyball), Delaney Scanlan (South Mountain volleyball), and Brianna Schrimpf (South Mountain softball). In addition to the individual awards, 37 Maricopa Community Colleges teams received academic honors for having an average team GPA of 3.00. 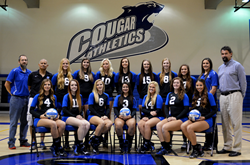 The teams with the top GPA in each sport are the 2014-2015 NJCAA Academic Teams of the Year; South Mountain CC’s Women’s Volleyball team took home that honor. CGCC (5): Golf (Women/Men), Soccer (W), Softball, Baseball; GCC (2): Softball, Volleyball (W); MCC (6): Baseball, Basketball (W), Golf (W/M), Softball, Tennis (M); PVCC (11): Golf (W), Indoor Track/Field (W/M), Outdoor Track/Field (W/M) Soccer (W), Softball, Tennis (W/M), Cross Country (W/M); Phoenix (6): Baseball, Basketball (W/M), Soccer (W), Softball, Volleyball (W); SMCC (7): Baseball, Basketball (W), Golf (W/M), Soccer (W), Softball, Volleyball (W).